Client Spotlight: Alliston Dental Hygiene Clinic — Function Creative Co.
Alliston Dental Hygiene Clinic is owned by Katie Kestle, who sat down with me recently to pick her brain about working with Function Creative Co.
1. Tell me about your business/design project. I run an independent Dental Hygiene Clinic in Alliston Ontario, conveniently named Alliston Dental Hygiene Clinic. We opened our doors in January 2015. My clinic is small and warm; we have one dental operator and are located in a mature medical plaza. My goal is to provide quality, gentle and affordable preventative dental services. I wanted my branding and clinic to have a professional feel, however, I wanted to avoid that typical “medical office” look. I wanted my clinic and branding to feel friendly and light, and we definitely achieved that. 2. Why did you need/want to hire a designer? I am a great Dental Hygienist, but I am not a designer! I know how powerful a well done sign or ad can be. A businesses logo, website and ads are generally the first way to grab the attention of potential clientele. I wanted a modern, bright and friendly look to my business and was advised by multiple people to hire a professional designer. 3. Why did you choose Function Creative to do the work? I chose Function Creative to complete my branding because I really loved the look of all of Danielle's work. Danielle’s previous projects caught my eye, because they looked very modern and clean. She is able to use simple designs to get across strong messages. I get constant positive feedback on my website, cards and the overall design of my business. 4. What is the importance of good/functioning design in your business? Because I am young and starting this business on my own, having a strong brand has been immensely important in creating a professional look for my business. I take my job very seriously and I want the public to notice that. Danielle was adamant that my branding be consistent wherever it appears. My logo, website, Facebook page, posters, flyers, business cards and even the information sheets I provide to my clients have the same font, colours and overall look to them. I receive positive feedback on the look of my clinic on a weekly basis. 5. How do you feel your brand/design work compares to your competition? Danielle was able to create a “dental logo” using a tooth that is still completely different from any dental logo I’ve seen. She was able to use darker background colours that create a beautiful contrast. My branding is young and friendly like I am, but still very professional looking. Because I am slightly different than a regular dental office (I work independently of a Dentist) it was important that my look be different too. 6. What advice would you give someone looking to hire a designer? Every designer has a different style and I think it is smart to find a designer whose work you already admire. We are a visual society. I know that I provide quality service, but I need my branding to convey that to my clients. I wanted my branding to make people feel inclined to walk through the door of my clinic and meet me. I think a successful business logo and design pave the path for the entire business. It is how the public will first notice you. It is so important to pick the right designer. It is money well spent. 7. Any additional comments or features you'd like me to share? About your business? About design? If you hire a professional designer to complete a project for you, you have to be okay handing over some control. They are the experts, know the market and what is in trend. Function Creative helped me build a business that I am truly proud of. Danielle treated the creation of my logo and branding like it was her own business. I’ve been open for 6 months and I am growing every week. I have no doubt that the branding Danielle created is a big part of that. Is it time to update your brand? 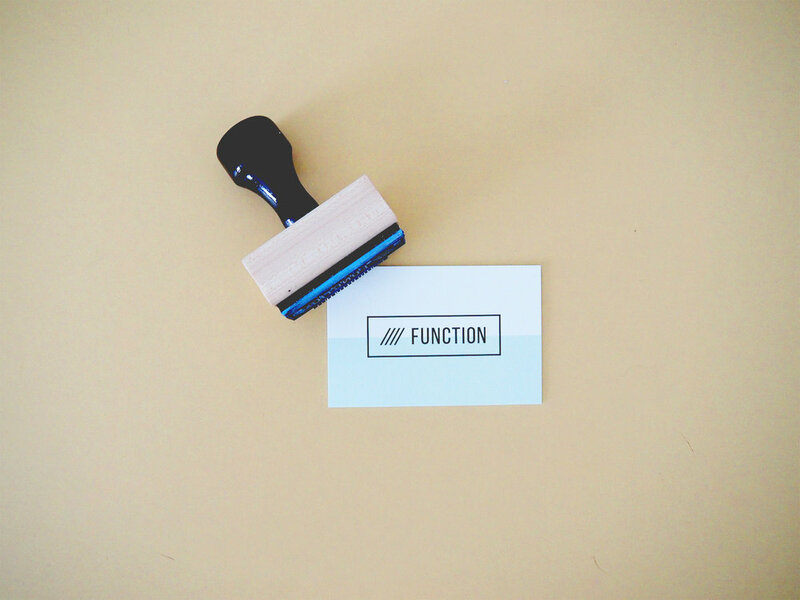 Let Function help you! We'd love to work together to bring out the best in your brand. Check out our services page to learn more about how we can best serve you.